Based in Toulouse, Southern France, Les Siestes Électroniques is a summer meeting point for emerging artists from the field of adventurous music. 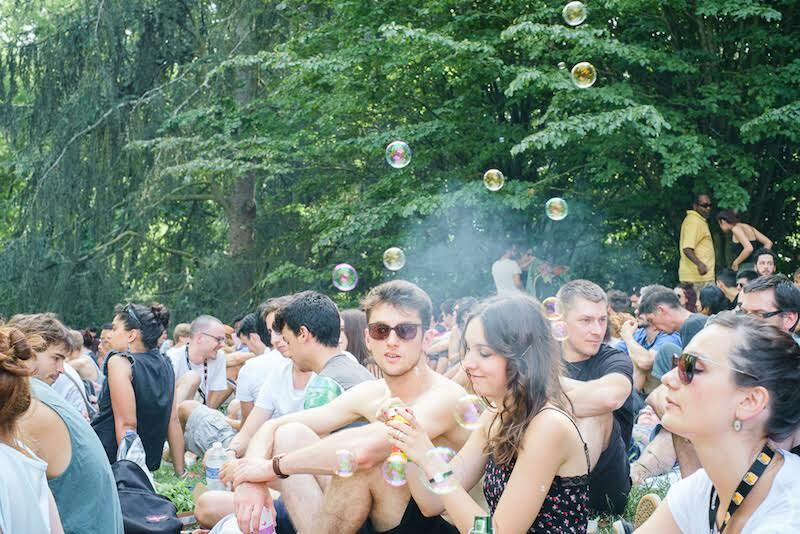 The festival consists of two editions – the Toulouse one takes place in a public garden and apart from concerts, also encompasses workshops, talks and other types of discourse about contemporary music. The Paris edition takes place within the premises of the ethnographical musem quai Branly. The Toulouse edition takes place between 25-28 June, the Parisian follows up throughout July 2015. Here, communications officer Jeanne-Sophie Fort and artistic director Samuel Aubert discuss the ins and outs of Les Siestes Électroniques. Can you talk about the motivations that were behind establishing Les Siestes Électroniques? Jeanne-Sophie Fort: When it started, its creator Samuel Aubert was living in Toulouse, and there hadn’t been many events in town related to electronic music. He wanted to introduce electronic music to a wider audience in a public garden during an afternoon in different conditions than those in clubs or rave parties. Over the course of those fourteen years he’s wanted to make people discover different kinds of music, so now we are not only focused on electronic music, but also music that is experimental, pop and rock, as long as it’s stimulating to our ears. Can you talk about the Toulouse edition? JSF: The point is to have it in a public garden in the heart of Toulouse because it’s easier for people to come, it’s in the end of June, usually the weather is good. There are many different spots where people can lie down and enjoy music with their eyes closed. The festival goers can reappropriate the public garden and listen to music however they’d like to. So it’s also like a statement against this dark, anonymous, hedonistic vibe which is inherently tied to the reception of underground electronic music. JSF: We focus on the daytime. It is a quite statement, even if you’ll find more and more festivals that welcome public on beaches. But the main issue is that we’re trying to engage a wider audience, not just a specific section of public interested in a specific music scene. That’s why we came up with this daylight context and why we’ve been struggling for 14 years to keep our initiative free of any charges. And that’s also why we’re now more than just an electronic festival. If party-goers want to go out at night, we invite them to go to the parties organised by our Toulouse partners in different locations. The festival connects all local promoters and venues and creates some kind of network. Can you talk about the dramaturgy of the festival? JSF: Les Siestes is run by an association of approx. 50 people, most of whom live in Toulouse, but also in Paris and the rest of the world. All these people are connected and they send their music tips to Samuel Aubert, the artistic director, who then makes a selection. Each year he wants to show something. This year, the lineup goes back to the roots of electronic music. We’ve got people from Singapore coming to do an experimental musical performance, etc. You don’t reveal your lineups. Why? JSF: We want to keep it secret until the D-Day. For most of our audience, our lineup is very obscure anyway. But they keep coming back! So we’ve figured out that not revealing the names on our bill would be a good way to celebrate the curiosity of our audience. It’s symbolic. It’s the way we’ll show each other (the promoter and the audience) our mutual trust. You also have a Parisian edition of Les Siestes Électroniques, which takes place a few weeks after the Toulouse one. JSF: Artists are invited to pick sounds from the sound bank of the museum and reappropriate them. This sound bank of ethnological and naturalist music is dedicated to researchers and is not open to public. The person in charge of this audio collection was frustrated because he had a massive quantity of music from all over the world, but he could not make it public to different types of audiences. Les Siestes suggested to invite artists from various backgrounds to recreate these sound materials and reveal their versions every Sunday afternoon over the course of the summer. Ethnological music has become interesting to a wider audience. Two years ago, we went to Vietnam to organise Les Siestes Électroniques with this project. JSF: The Vietnamese do not listen to music the way we do. It is a communist country, people are not used to listen to what they want to. We were curious about what would electronic music be in a context of a country where there is no electronic music scene apart from Japanese and Korean pop. What we noticed is that people dance together, it’s almost choreographed. In Europe, people are more individualistic. In Europe, the focus is on our feet, while having our eyes closed, concentrated on our inner feelings. The way we perceive music through our bodies says a lot about the way we consume it. It was very interesting to experience the fact that people do not listen to music the same way we do. When we were in Congo to organise an edition there, we realised that music has a different meaning there. You should have a look at our web-documentaries to discover the density of these experiences abroad. You also have a DIY music academy. JSF: We did that 3 or 4 years ago. The objective was to gather people who wanted to experience and hack machines. Four people kept meeting up after the festival and created a band called Do It Yourself Music Academy that has become “DIMA” throughout the years. Later, we renamed our workshops to Futurism. These are meetings for people who work in technology and make music – workshops, conferences – centred around the question What is music today?. Can you talk about the artists who represent your festival in SHAPE? Do these artists have something in common? Do you think they explore the question that you as the festival also asks? SA: I don’t think that these three artists have something in common, but they are good examples of the possible diversity of contemporary music and they are definitively challenging the way we listen to music. These artists are making something idiosyncratic. It is hard to put them into a specific genre of music. The art of listening is important to you. SA: The art of listening is at the heart of our job. The difference between a good and a bad festival is all about the art of listening, the condition you are providing to the audience to experience the music at its best. What about the future of Les Siestes? And you will keep posing the question about music and the music making of today? JSF: Everything we do at Les Siestes Electroniques is an answer to the question “what is music today”, and actually, how we listen to it and compose it nowadays. The reception is also very important, the quality of sound and the places to listen to music. People can experience the festival in a normal way, or if they want to experience it differently, we’ll make it possible.